With the deprecation of the JDBC-ODBC bridge in JDK 8, there is a gap in support for ODBC connectivity in Java-based applications. The CData JDBC-ODBC Bridge is a seamless replacement for the Sun JDBC-ODBC Bridge. Simply drop the CData JDBC-ODBC Bridge in place and connect to ODBC data sources in exactly the same way. There is no need for additional applications or installations. This article will serve to compare the Sun JDBC-ODBC Bridge (available in JDK 7) to the CData JDBC-ODBC Bridge1. In our comparison, we used the open source MySQL Connector/ODBC2, largely to avoid any bias in using our own proprietary ODBC Driver for MySQL. In order to provide a benchmark, we installed MySQL Server 5.7 on a test machine and inserted a relatively large dataset into the database. Since the bridges are being compared side-by-side, the performance of the machine itself is relatively unimportant; what matters is how the bridges compare relative to one another. The dataset consists of 1,026,779 rows of data (3.45 GB) where each row contains information about a restaurant. The results were read and stored in a new string variable for each row. The times found in the chart below are averages based on multiple queries, which should serve to level out any outliers due to spikes in network traffic, etc. 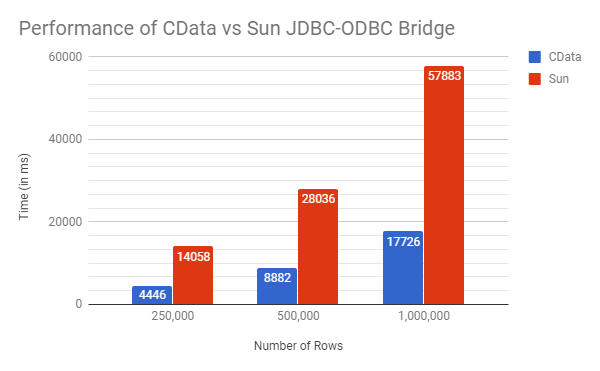 As can be seen in the results, the CData JDBC-ODBC Bridge provides a significant improvement over the Sun JDBC-ODBC Bridge, regularly retrieving and processing results over three times faster. It is noteworthy that the CData Bridge only improves its gains as the data sets increase in size. The CData JDBC-ODBC Bridge offers performance that far exceeds that of the Sun JDBC-ODBC Bridge. Our developers have spent countless hours optimizing the performance in processing the results to the point that the drivers seem to only be hindered by web traffic and server processing times. This performance is particularly highlighted when the driver is required to process large amounts of data.